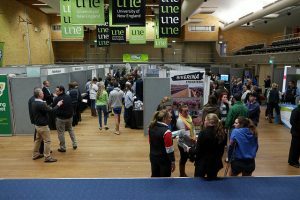 UNE agricultural students will get the opportunity to start planning their future careers when UNE holds the Farming Futures careers fair and dinner next month. Farming Futures is a student-run event that showcases a variety of careers in the agricultural industry while also giving soon-to-be graduates networking opportunities. Students are encouraged to complete their degrees whether it is in Agribusiness, Rural and Animal Science, Agrifood systems or Resource Economics. Farming Futures also targets high schools and TAFE, providing information about university degrees in agriculture. Companies involved in the careers fair are able to benefit from meeting the next generation of professionals. Industry representatives and farmers have the opportunity to promote their businesses and tell their story of how they got where they are now. Farming Futures responds to current industry demand for new, innovative and sustainable development, targeting high school students and soon to be university graduates. Schools from local and surrounding areas are encouraged to attend the fair’s School Program. This year the careers fair will feature a new addition to the day’s events – a series of short seminars aimed at high school students run by industry representatives and UNE graduates on various aspects of the agriculture industry and job and study opportunities available. An industry dinner held at The ’Stro, UNE, allows both students and industry representatives to meet-and-greet in a more casual context. Susan Bower is the guest speaker and will discuss her personal and professional experience in the agricultural field. Susan is head of AgriBusiness for Westpac and an ex-UNE student. The dinner will also include an auction to raise funds for a chosen charity. The careers fair and dinner will be held on Friday 29 July at UNE in Armidale.